What are the AIOps platforms? 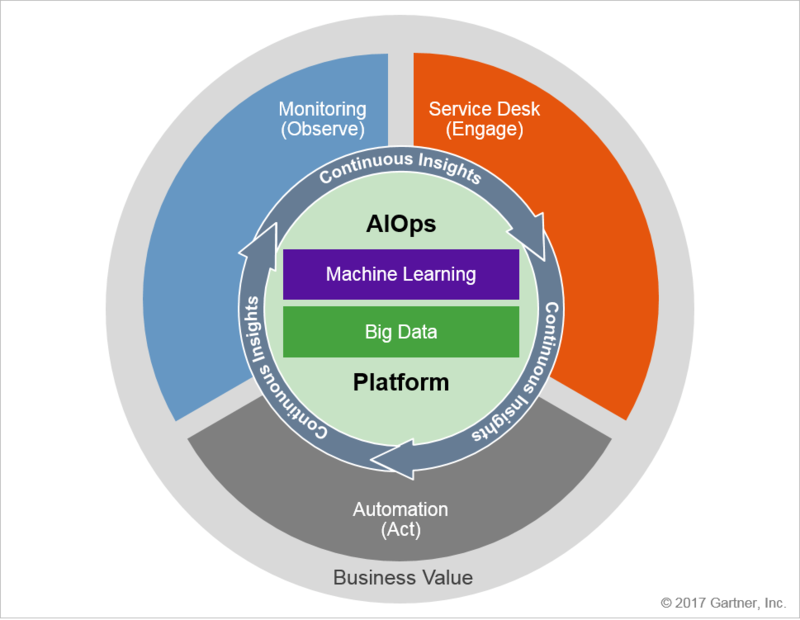 According to Gartner, “AIOps platforms are software systems that combine big data and AI or machine learning functionality to enhance and partially replace a broad range of IT operations processes and tasks”. AIOps platforms help organisations to deal with availability and performance monitoring, event correlation and analysis, IT service management, and automation. AIOps is about reducing the amount of work for IT personnel when dealing with the vast quantities of machine data generated by infrastructure hardware and software. The augmented algorithms of AIOps platforms can ingest data from different sources, store the data, provide access to the data, and enable data analytics at the point of ingestion and in storage. After that, the analysed data enable users to discover the patterns that describe or generate the data sets being considered. It’s not just simply gathering data for manual analysis anymore, the system is now capable of deriving meaning from large data sets on its own with or without human input. The platform can predict possible incidents and emerging usage profiles, and support tracing back in time to determine the root causes of current system behaviour. AIOps platforms not only provide assistance in IT functions but also enhance human’s capabilities to perceive insights. AIOps platforms allow IT operations to utilise advanced analytical capabilities, thus, deliver proactive insights. This process is informed by an automated, algorithmic learning capability analysing an unprecedented breadth of data. AIOps platforms are adaptive to multiple skill levels and use cases. Specifically, AIOps’s assistance feature is effective for technology domain specialists/experts, developers and DevOps professionals. On the other hand, its augmentation capability is a perfect fit for IT operation generalists, architects and business professionals. The automated workflow can be upgraded with the integration of deterministic explicit knowledge, human tacit knowledge and AIOps-driven behavioural analysis. Intelligently Adaptive (Heuristic) Automation provides more advantageous outcomes in dynamics conditions. Machine-generated and Managed Automation identifies the patterns of positive behaviours that could be automated and codified in the form of automated tasks and workflows. Then initiate the automated tasks and workflows given certain conditions and develop them even further based on outcomes. Systematically, Automated Behaviour Prediction can monitor the behaviour of applications, infrastructure and users, and proceed to analyse the data to predict probable future events that can impact the availability and performance of the IT function. AIOps platforms support the combination of different analytical approaches and applied to a broad set of data to run Causal Analysis – the process of suggesting and comparing multiple probable root cause of availability and performance issues. Any potential or current service impairments can be predicted and notified through the Intelligent Notification system. Meaning the IT operations personnel are proactively notified and alerted to have appropriate responses. Besides intelligent notification, AIOps platforms provide the existing collaborative workspaces or communications streams with contextually relevant knowledge artefact. These Intelligent Collaboration functions will enhance the recommendations and suggestions, in order for them to dynamically adjust as the interaction progresses. One of the most valuable features of AIOps platforms is Business Opportunity Discovery - the ability to analyse both IT operational and business data, patterns of behaviour to explore all the potential positive business outcome. AIOps platforms provide Dynamic Decision Support, which is the access to real-time and historical analysis of both IT operational and business behavioural data to put together recommendations for the decision-making process. The future shape of AIOps technologies? The applications of AIOps platforms can be further developed into IT security operations and business intelligence strategies, as it opens the access gate to the rich data and context created in the course of IT operations. Although AIOps technologies are said to reshape the face of infrastructure management, create impacts on both enterprise data centre and cloud infrastructure management. As captivating as it sounds, IT operations teams must avoid the temptation to do it all at once and take careful steps to deploy this convergence of AI and ITOps. Furthermore, despite the maturity of the underlying technologies of AIOps, it is still an early field in terms of combining the technologies for practical use. In order to be successful, it takes efficient data management and substantial time and effort to implement, maintain and manage a working AIOps platform. Want to read more Technology-related content? Subscribe to our blog or download our whitepaper to learn more about this subject.